October 10th: What's On Today's Show : Blog Of The Nation In the first hour of Talk of the Nation, the difficulties for many veterans to adjust to civilian life, and law Professor Jonathan Turley explains why he feels President Obama is a disaster for civil liberties. In the second hour, a portrait of the new India, and the debate on food stamps. 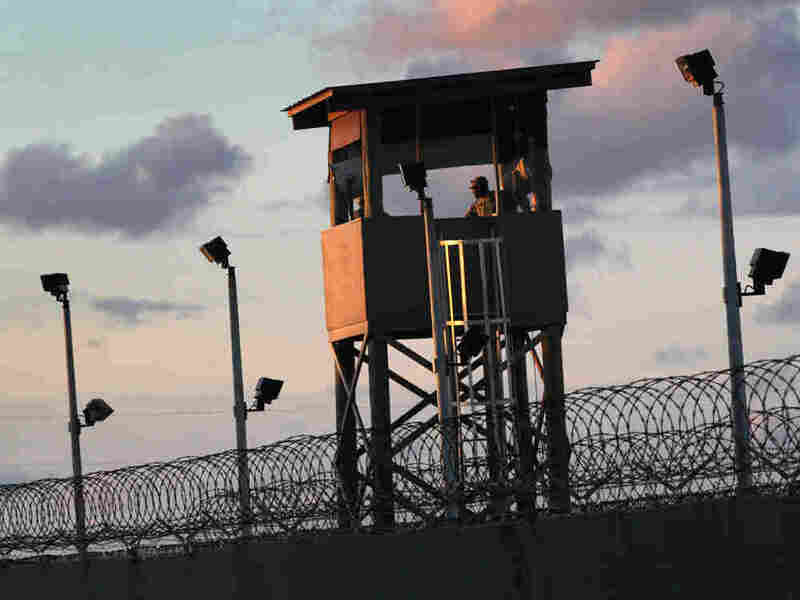 A U.S. military guard tower stands on the perimeter of a detainee camp at the U.S. detention center for "enemy combatants" on September 16, 2010 in Guantanamo Bay. It's a rare time in U.S. military history; during the longest period of sustained warfare, members of the military make up just one half of one percent of the U.S. population. With fewer people sharing the burden and exposed to military life, many veterans are having a difficult time adjusting to civilian life. That's just one of the disconnects between military veterans and civilians revealed in a new survey by the Pew Research Center. Guest Host John Donvan talks with recent veterans, retired Army Maj. Gen. Mike Davidson and Paul Taylor, Executive Vice President of the Pew Research Center. Law professor Jonathan Turley argues in a recent op-ed that "the election of Barack Obama may stand as one of the single most devastating events in our history for civil liberties." As president, he says, Obama continued or expanded many of the most controversial programs begun in the Bush administration. Even worse, Turley wrote, is what President Obama has done to the civil liberties movement itself — many civil libertarians don't speak out against this president. Turley joins guest host John Donvan on the Opinion Page to talk about his Los Angeles Times op-ed entitled "Obama: A Disaster for Civil Liberties." Years after leaving his small village in northern India, journalist Siddhartha Deb went back to work undercover in an Indian call center and set out to explore the true impact of globalization on his homeland. In a new book, Deb exposes the dark side of the many images of Indian prosperity through the lives of a rural farmer, an ambitious hotel worker and an affluent movie producer. Inevitably, he found, the globalization that helped make India a global player continues to leave millions behind. Guest host John Donvan talks with Deb about his experiences in India and his book, The Beautiful and the Damned: A Portrait of the New India. The number of Americans relying food stamps jumped 70 percent over the past four years. As more people join the program, there's a growing debate over whether or not recipients should be able to use food stamps at fast food restaurants. In a recent op-ed for the Milwaukee Journal Sentinel, Sherrie Tussler, executive director of Milwaukee's Hunger Task Force, argues that too many people don't have access to grocery stores and should be able to use their benefits at fast food restaurants in an effort to give them "access, choices and dignity." Tussler joins guest host John Donvan to talk about fast food, food stamps and dignity.